Many people use USB flash drives for transfer files, they often plug their Flash drives for many computers. Therefore, most of the usb drives are contained malwares, viruses etc. On the other hand, these USB drives are the spreaders of that kind of malicious applications. If you can disable or lock USB port temporarily, they can not be able to plug their Flash drives to your Computer or Laptop. There are several ways for disabling USB ports such as using Regstry Editor, Disabling autorun and using software. Today i am going to discuss about how to disable and enable the USB ports. First, you need to go to Registry Editor (Start > Run > type " regedit " without having quotes). Double click on the start key which is in the right side. Then it will open a window, you will see Value Name and Value data. In the value data field , you can change the value to 4 to disable USB ports. When you change that value to 3 it will enable USB Ports. You can also write a Registry Key for doing this process, simply open the Notepad and write below code exactly as it is. Then, save it by giving a name with .reg extension and set ANSI as Encoding. Change the Save as type to "All Files" and give a name with .reg (ex: Disable_usb.reg) as shown in below figure. 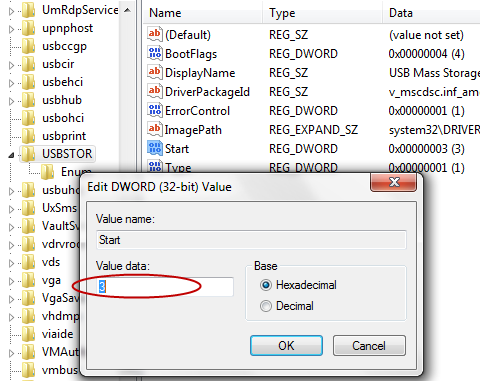 Now,you can also make reg file for enabling USB Port by changing dword value to 00000003. By double clicking these two reg files, it can be easily Disable and Enable USB Ports. Remove the USB Drive and again plug for applying these settings. I have made these Registry Files for you so, if you unable to make these files download it from here link. 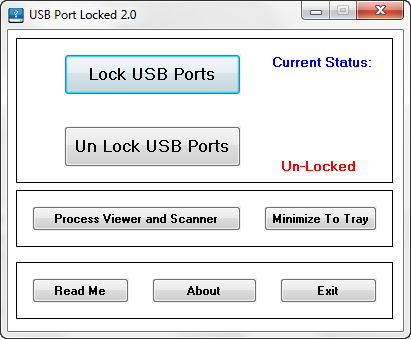 There is a small application available for Disabling and Enabling USB Ports called USB Port Locked 2.0. Using this application, it may be easily done.